It wasn’t all that long ago that I was a ‘newbie’ blogger and in fact, still considered myself a ‘newbie’ until I realize that Smith Bites is nearly two years old . . . wait . . . huh? As in how . . . what the . . . and when . . . did that happen?? And somewhere early spring of that first year, I began seeing tweets about a ‘Big Summer Potluck’ event happening somewhere in Pennsylvania; turns out that Maggy and Erika were the two tweeting and they had me in stitches with their banter . . . so I joined in the fun. I quickly learned that BSP (as it was tagged in Twitterverse) was a group of East Coast bloggers getting together for an afternoon meet-up and sharing in a potluck that afternoon. But in the blink of an eye, BSP gained traction and what started out as 10-15 blogger get-together became a full day conference with nearly 40 attendees, key-note speakers and a place to meet fellow bloggers in real life. I wanted in . . . the only problem? Riegelsville, Pennsylvania . . . near Bethlehem, Pennsylvania . . . uhm, ok, but can anyone tell me which way is Pennsylvania??? BSP was my first ‘official’ event wherein I would leave the comfort of my home, sitting on the couch in my jammies and tweeting with other people from all over the world sitting on their couches in jammies . . . and I would also be traveling without The Professor . . . which meant I had to rent a car and actually drive from the airport through said Bethlehem, Pennsylvania to Riegelsville. And when I tweeted Maggy to say I was directionally challenged, I’ll never forget her response . . . ‘Bless your heart, we’ll keep an eye out for you . . . I literally laughed out loud . . . ‘ Phew! That makes me feel sooooo much better . . . But you know what? I am so glad I made that trip because that single event helped connect me to people that I’ve made lasting relationships with, people I genuinely care about. I could make an entire list of all the positive things that happened to me on that trip alone; but this post isn’t a plug for BSP . . . it’s about one recipe . . . in fact, I believe the two most requested recipes from that day were for doughnut muffins and this Meatless Muffuletta sandwich . . . as in, we could not stop tweeting about those sandwiches – you know it’s a great party when people are still talking about the food a week later! We begged, we pleaded for the recipe; and the moment it was in my hot little hand, I hit the grocery store, list made and ready to recreate those fantastic flavors – divine! The women of the blog ThreeManyCooks, Pam Anderson and daughters, Maggy and Sharon, created the recipe and I was thrilled to see that Pam included it in her new book, ‘cook without a book, meatless meals’. These days, many people are either minimizing the amount of meat in their diets or forgoing meat altogether for a vegetarian lifestyle; this cookbook is designed to help make the transition seamless with great tasting, easy-to-make meals – and you probably have most of the ingredients in your pantry. The best part about this sandwich is that it is meant to be made in advance and allowed to sit for a few hours or overnight in the refrigerator so that all the wonderful flavors blend together. You must use a good crusty bread here – Pam uses Portuguese rolls but I’ve also used Ciabatta and Fococcia; any bread with a nice crispy crust and soft interior is best – using regular sandwich bread results in a soggy mess and completely falls apart. Another plus? No need for any type of mayonnaise or mustard – the olive oil and vinegar from the marinated vegetables soak into the bread without making the sandwich soggy. I generally make one large sandwich, cut it into individual portions, wrap and refrigerate overnight and voila, The Professor’s lunch is ready in the morning! I’ve taken a few liberties with Pam’s original recipe but I think she’ll approve! SMITH BITES NOTES: Pam makes her own olive spread which is fantastic, but I take a cheat here and use either Olive Tapenade or a jarred Muffuletta mix, found in some specialty shops. I also like the addition of Peppadew peppers – a vinegary, sweet-spicy pepper from South Africa that works well with these flavors – you can substitute jarred roasted red peppers if you prefer. Pam also uses Portuguese rolls and serves them immediately. I use a Ciabatta or Fococcia loaf, put them together the night before, wrap and refrigerate. I’ve also made this the morning of a hike, tossed in a backpack and devour at lunchtime – terrific! Cut into individual portions, wrap in parchment and refrigerate a couple of hours or overnight; serve. 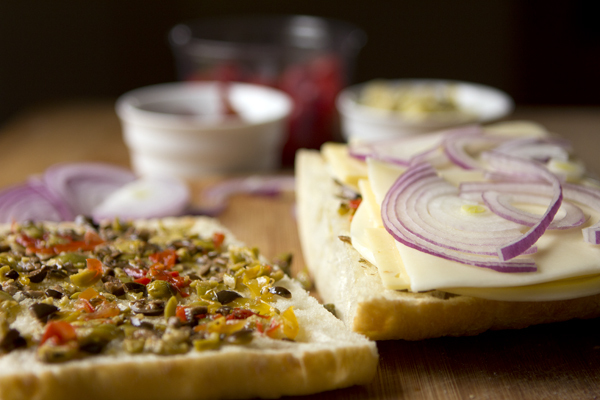 ** You will most likely have tapenade left over – lucky you! 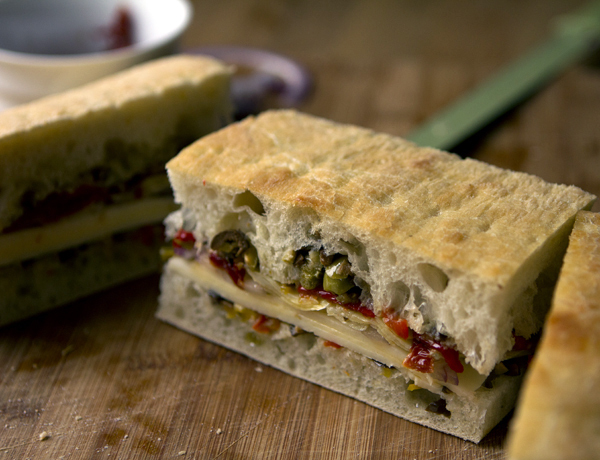 Make another sandwich, throw in a fritatta or toss on a pizza! I can see why you would beg for this recipe! 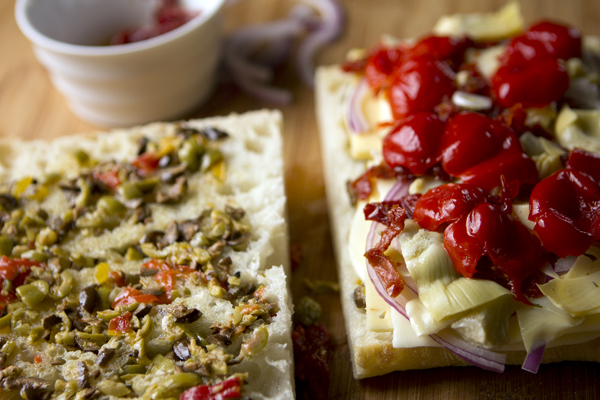 I’ve got a friend who bakes a killer focaccia–maybe I’d better team up with him and make a few of these! Beautiful sandwich. Perfect for a beautiful blog and woman. Two years and going strong. Keep up the wondeful work, Debra! And my best to the Professor as we approach the holidays! Aren’t these sandwiches marvelous? So glad you made them too! Ok…I’m in love with a sandwich. There, I said it. I was also wowed by this sandwich! 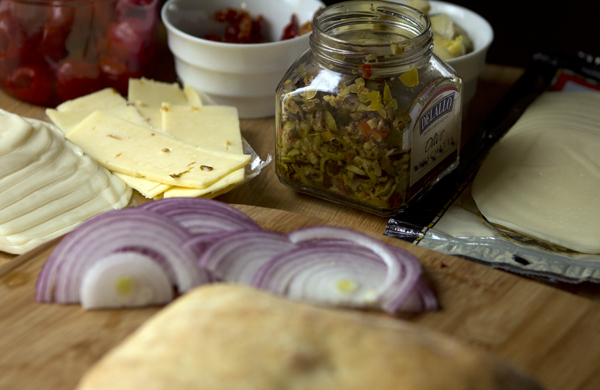 I had never heard of a muffuletta before and I just loved it and make it often as well! I love your addition of peppadews (I am cazy for them)! Congrats on your two years it really passes by quickly doesn’t it!! I remember that day well, AND that sandwich, and you’re right the meat is not missed at all. Yum! What a fun meatless recipe to try out. Even better that it can be made ahead of time. I absolutely love the women of Three Many Cooks and Pam’s meatless recipes have inspired me on many Meatless Mondays. 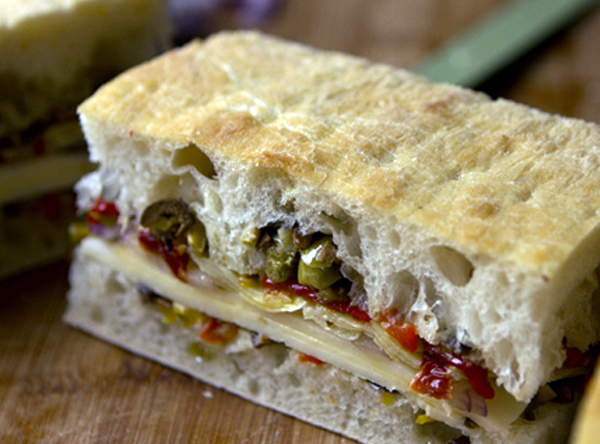 I will have to try this muffuletta. By the way, congratulations on Smith Bites’ turning two. I hope there are many more years to come.